From the Valentino site, I learned that the Creative Directors are Maria Grazia Chiuri & Pierpaolo Piccioli. Larkowsky was in turn inspired by Emilie Flöge, a fashion designer and business woman whose style fell squarely in the Wiener Werkstãtte. She was also a muse for Gustave Klimt, also hashtagged by Larkowsky--a nod to both Klimt and Flöge. He also follows I Have This Thing With Floors --I wrote about them a few posts back--and there is also a inspirational pattern there. 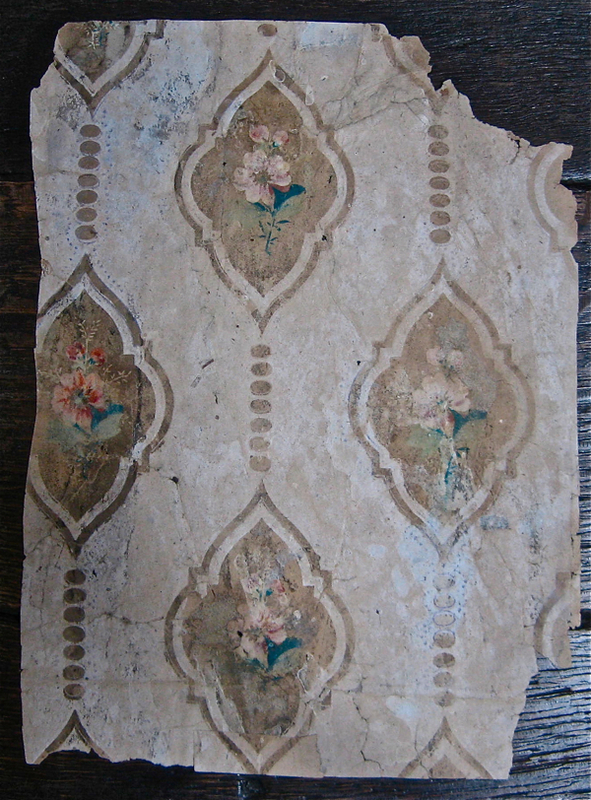 I just googled "patterns" and I came up with a variety of responses from sewing to tiles to patterns in nature. A Scientific American article from 1986 on chaos suggests that in nature patterns "repeat" but not exactly in the same way because small differences in the starting points can lead to very different outcomes. Many natural patterns are shaped by this "apparent randomness". By the way, I am also blogging once a month on the Hudson Valley Etsy Team. Check out the blog here. Last week I started to write a post that was off topic because it was my post deadline, but I decided to delay the post until I had more of the floor completed. I decided to skip the system and work without too much of a plan. I think the only system that I am using is to balance the intricate areas so the pattern is not too complicated all over and hard on the eyes. Ugh...try to avoid looking under your oven if you live in an old house. Next post, some notes on pattern. I have been enjoying a new newsletter called Stella Spoils. It claims to provide inspiration for the "cool kids" daily in your inbox. I have been skimming it but have come across some interesting articles, perspectives, and Instagrammers. I was really excited to see @ihaveathingwithfloors. The Instagram is fun simply for the dynamic patterns that we create in our domestic and public sites. And if you like shoes, you will love not only what people wear on their feet but how they wear them to intensify their patch of floor. @ihavethisthingwithfloors is curated from Amsterdam but made by us. Make a selfeet (selfie+feet) and tag the Instagram photo with the hashtag #ihavethisthingwithfloors. It will likely be included! Start looking down and wearing your good shoes. Speaking of having a thing with floors... This is what is starting to happen on my floor project...I hope to have a full day to work on the tiles next week to see where things go. I am bringing my good shoes to take a selfeet for #ihaveathingforfloors when I am done. I started the floor this afternoon with the idea that I might pull it up. Working from this angle gives me a great sense of relief. The funny thing is that I had so much fun! Listening to James Ward talk about the history of office supplies on WNYC/Leonard Lopate +ergonomic Xacto+ @theduckbrand tape + hydrogen peroxide to clean the floors=freedom/in the zone. I am using regular @theduckbrand tape in black and white. I was thinking about Pre-War New York Apartment style and Sol Lewitt. It just seemed like the right combination. The contrast is great. I am thinking about continuing the diagonals around the perimeter of the room and playing with lines throughout. I cannot decide if I want to create a Lewittian strategy like, " vertical lines of black and white @theduckbrand tape against horizontal lines of black and white @theduckbrand tape" or, just free-form it. Stay-tuned for the strategy that I choose or, that chooses me. Hope there is sun where ever you are for the weekend. That's in the title of an article from The New American Home, November 1957. The magazine urges parents not to let their kids have all the fun. Readers take hold of the kids' crayons and get creative. 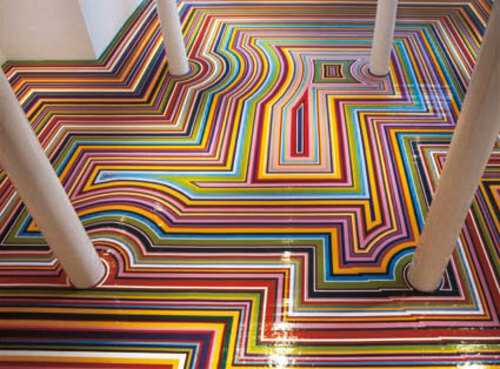 It's actually a cool idea...and it is feeding into my thoughts about Sol Lewitt and jim Lambie and my kitchen floor. The magazine offers several design ideas and suggests that readers create rather than copy their designs. The DIY movement was alive and well in 1957.Refreshingly un-prescriptive. Interestingly, DIY had a renaissance after the Second World War. Plastics and new adhesives, developed for the war effort, were capitalized as commercial products for DIY'ers. And the arrival of television, magazines, and exhibits, the general public was exposed to these amazing products and with the onus to do thing themselves. We moved recently and our kitchen floor is in bad shape and not the kind of bad shape that is interesting. As a creative person, I have been trying to think of ways to salvage it. Sign vinyl, my medium of choice, is the first thing to come to mind because of its tremendous ability to cover up anything. When I am brainstorming, I start at my book shelf and survey the scene. I grabbed Tape: An Excursion Through the World of Adhesive Tapes from the shelf and re-discovered Jim Lambie’s floors. They are a hi-lo take on floor mosaics and tile patterning with subtle breaks and angles. Dynamic compositions that make the humble floor an enormous and colourful abstract painting. Like Sol Lewitt’s of the floor.
" Most walls have holes, cracks, bumps, grease marks, are not level or square, and have various architectural eccentricities." *Sol Lewitt, Wall Drawings (Arts Magazine, (New York), April 1970. I think I could insert the word "floors" for "walls". What I like so much about Sol Lewitt are the parameters that he gives himself for his work. I am channelizing Sol Lewitt by giving myself some parameters: Black and white will be my starting point. Brief: patterns for squares that can be created of shapes cut from a 2 “ wide strip of white or black duct tape placed on each square. Next week, 1970's design to follow 1970's art on a 1970's floor. My friend Lauren emailed me these cool little abstract animations. You can see more of Rafaël's videos here. Don't forget to move your cursor over the image. Be careful if you are optically sensitive. Some can be a bit headachy. Check out his BYOB. I LOVE this idea! Please read the FAQ if you want to organize your own BYOB." Let me know if you decide to organize one. Better get started on some animations! not sure how they will figure into the final work but that is the fun. I always have a pit in my stomach when I work. The stress spurs me on when I think that I can't do it, make it, finish it and my pride keeps me on track. Here are some drawings from yesterday. I think the actual pink that I will use is a bit lighter but no less offensive. I am going for a colour that I heard about on a Science Friday interview with Adam Alter author of Drunk Tank Pink: And Other Unexpected Forces that Shape How We Think, Feel, and Behave called affectionately "drunk tank pink" because it is supposed to have a (short term) calming effect on people and was used in jails and locker rooms to calm prisoners and football players. Although it seems as if it wouldn't work with the wood, I think that it does. The tape rides again! The remaining rolls of my limited edition Colouring Tape from DesignBoom MartToronto at IDS are now available at distill gallery﻿ in Toronto! Both are boxed sets. The Minimalist includes one black Sharpie marker and the Creative Sweet includes 2 rolls of tape, 3 Sharpie Markers, and a tube cap to make a Pen Holder (or iPhone speaker stand!). If you are in Toronto, pop into Distill. For more ideas on how to use the tape, make sure to check out my tumblr on tape art and the world of adhesive papers. "All external expectations, all pride, all fear of embarrassment or failure - these things just fall away in the face of death, leaving only what is truly important. Steve Jobs has always followed this mantra. It is so simple and so wise and yet so difficult to embrace. I admire his spirit of experimentation and drive. This ephemeral film (via ecoterre) from the 1930's is funny but not that far fetched. Clothes that can be adapted for day and night and the disappearance of the skirt seem fairly typical in 2011. And despite the slightly unfortunate wizardly look of the male "spacesuit", we are all carrying our phones, coins, keys, and 'candies for cuties' in multi-functional pieces that go from day to night. Wonder what is up for the 80's and 90's--the 2090's that is?